Every year we like to hang a different Christmas wreath on our front door during the holidays. 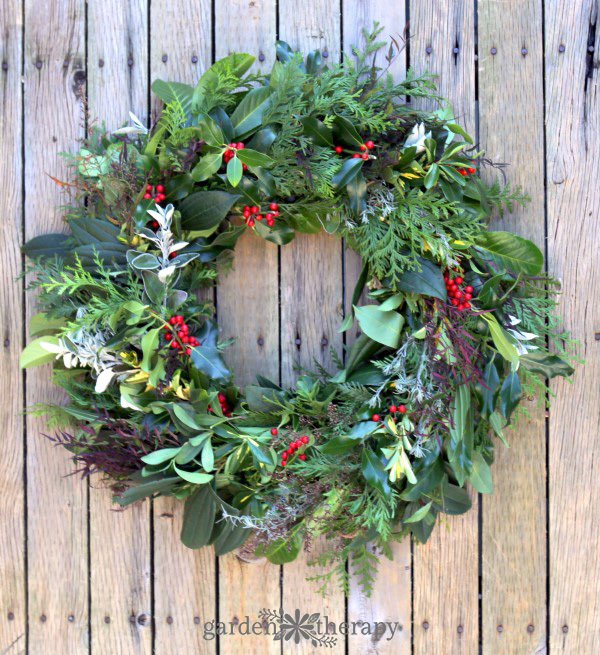 We’ve amassed a collection of wreaths to match the holiday season trends of sparkly red berries, Christmas ornaments, peacock feathers, and square-shaped boxwood, but my favorites are most certainly natural, fresh wreaths. 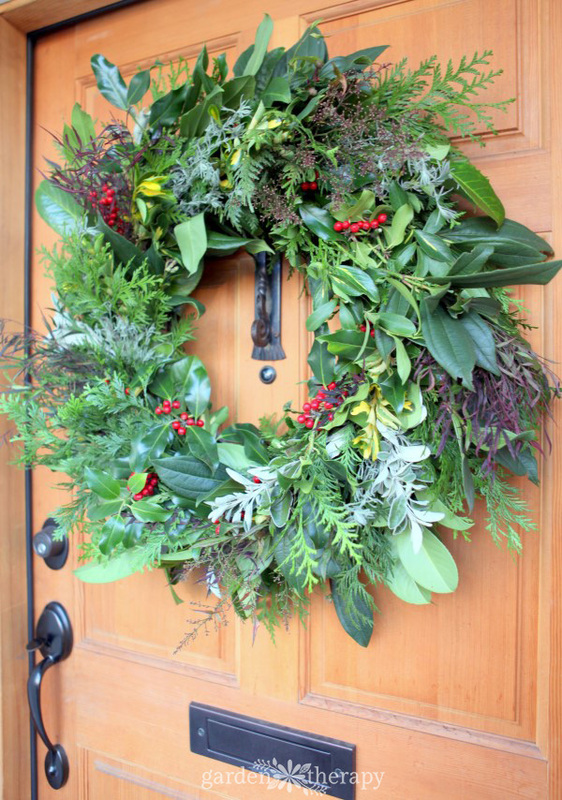 A fresh Christmas wreath makes for an individual work of art that smells as good as it looks. 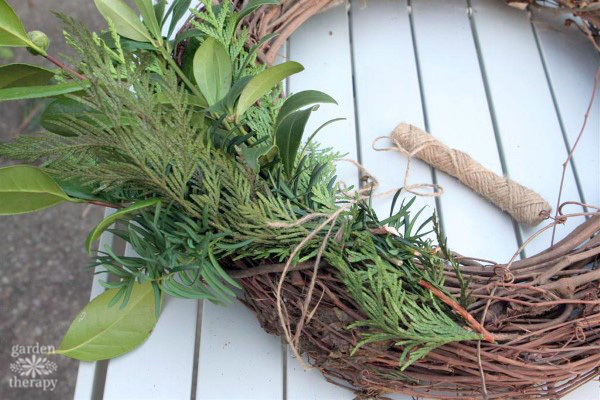 Florists and garden centers are wonderful places to find one to suit any style, but if you are feeling adventurous, a homemade wreath made with garden clippings or purchased greens can be most gratifying. Given the current popularity of lateral space gardening, there are supplies available for all sorts of wreath plantings. Evergreen, succulent, moss, and flower wreaths are beautiful micro gardens that will suit most any style or climate. 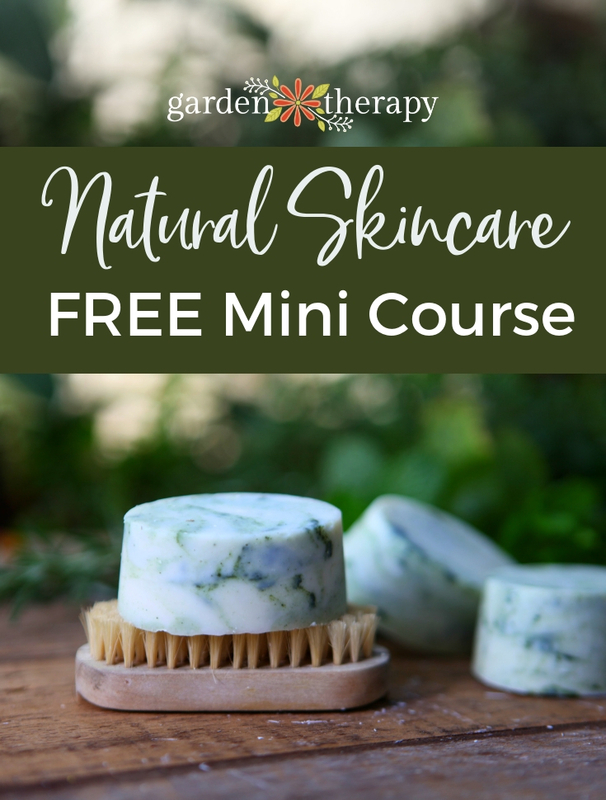 Care will vary depending on what type of planting you decide on, but many will last for months, if not years, with a couple weekly squirts of a spray bottle. 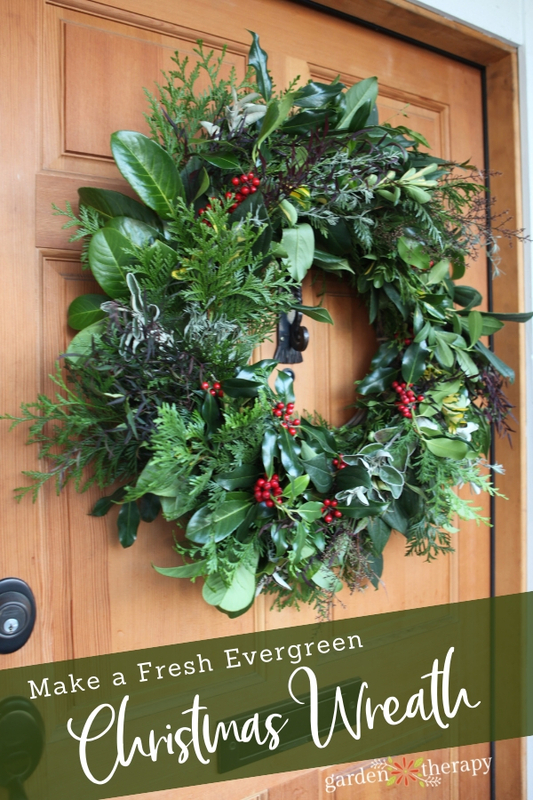 Step 1: Gather a variety of foliage, berries, twigs, pinecones, ribbons, and anything else you want to add to your wreath. Some of the evergreen cuttings that work very well are: holly, cedar, contoneaster, yew, pine, pieris, boxwood, laurel, camellia, fir, cypress, and magnolia. I like to contrast needles with broad leaves and vary the color, but a wreath made of entirely one type of foliage can be incredibly dramatic. 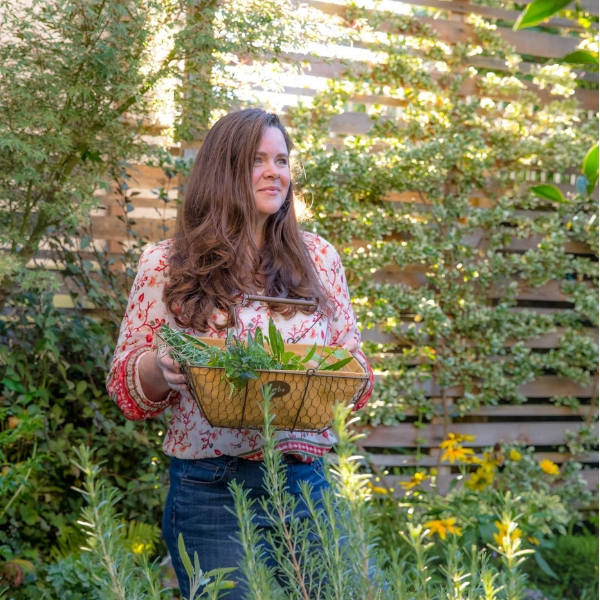 Also, think about tucking in herbs like rosemary, sage, and lavender into the foliage to add another delightful aroma. 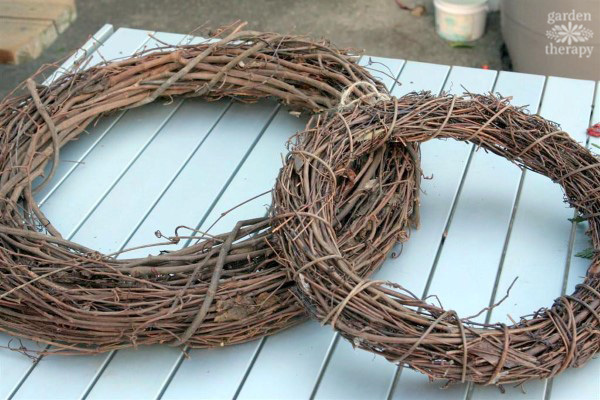 Step 2: Using a grapevine wreath as your base (you can buy one or make your own), start by choosing a firm branch with a stem that is thick enough that it will not bend easily. 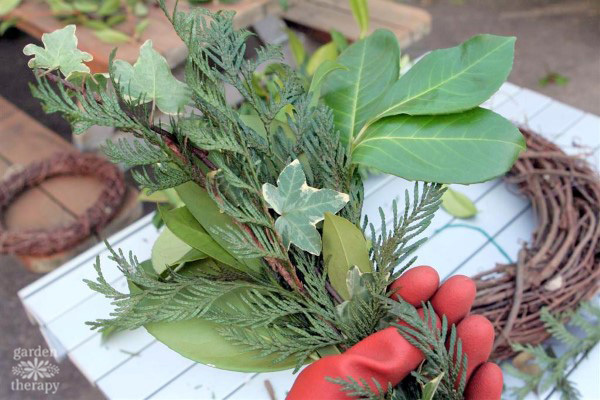 Add other cuttings of different foliage on top and gather the bunch in your hand. Snip off any long stems. Step 3: Using the twine, wrap around the bunch and the grapevine wreath together a few times until secured. For the first bunch, tie a knot in the twine to hold it in place but do not cut the end of the twine. Step 4: Gather a second bunch of foliage. Lay this bunch overlapping the twine securing the first bunch to the wreath. Wrap twine around the base of the new bunch a few times and set down. 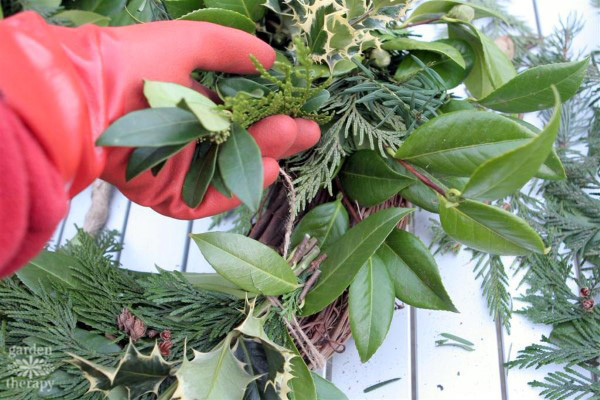 Continue adding foliage to the wreath by overlapping the previous bunch and securing with twine until there are no more gaps to fill. Step 5: Secure the final bunch by gently lifting the foliage from the first bunch and tucking the stems underneath it. Secure with twine and tie off the final bunch with a few knots. Step 6: Now take a last look at the wreath. You can tuck in a few more greens to even out the design or add a few embellishments such as pinecones (using florist wire to attach them), berries, ribbons, or even ornaments. 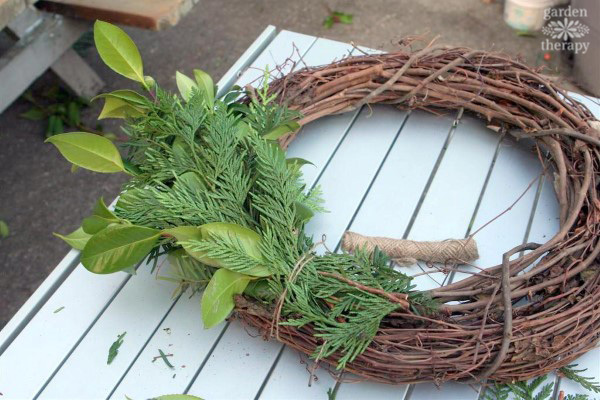 The final word on making a perfect wreath: just have fun with it. 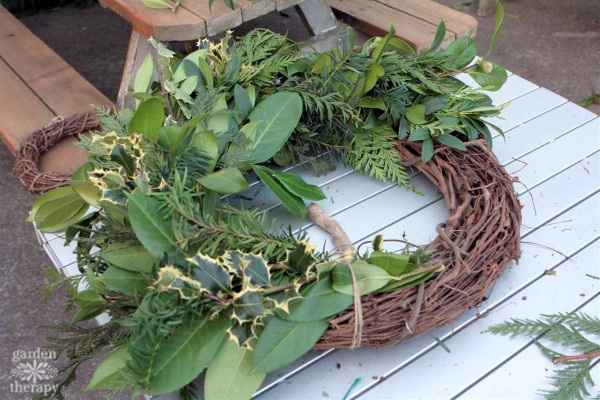 Experimenting with different foliage will allow the wreath to become traditional or modern, contained or wild, themed or everyday. A special thanks to the wonderful neighborhood gals who provided all the foliage, wine, and treats that go along with the annual wreath-making afternoon. 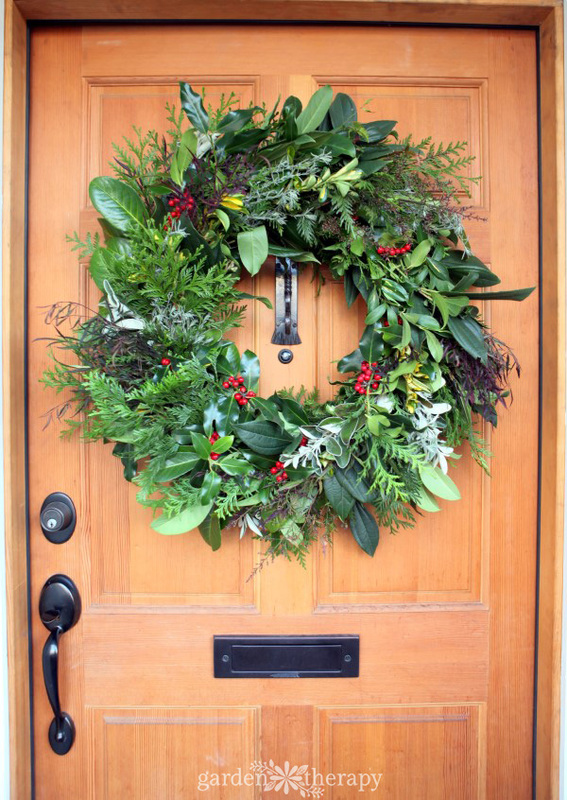 For more wreath inspiration, see this post.